The above equation relates the specific energy to the Froude number of the flow in addition to height of the invert above the datum and the height of the column of flow above the invert. What is the Energy-Depths relationship in open-channels flow? To answer the above question, one needs to consider a more factual concept of energy. The sun is considered a source of energy. It emits light rays that can be felt by the senses. But what about the energy content of water; how does one evaluate it? Open channel hydraulics is not concerned with the energy content of the water on an atomic level. It is concerned with its kinetic energy as a flow regime. Also, it is concerned with its potential energy fluctuation relative to a reference datum. 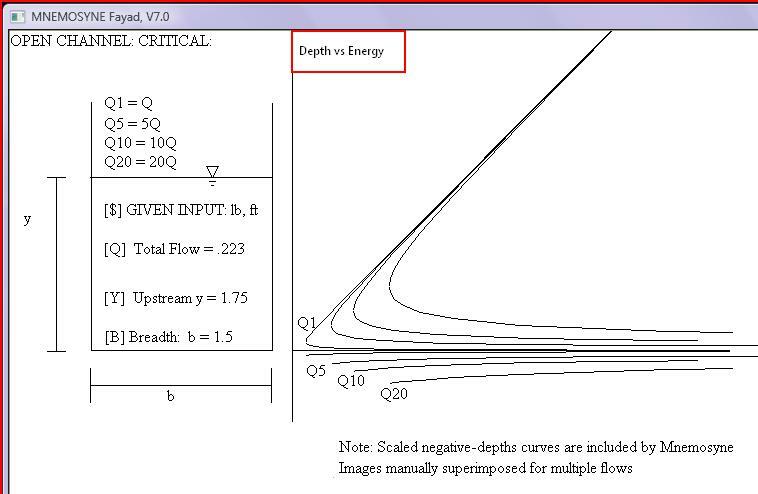 Hence, Bernoulli's energy equation applied to the hydraulics of open channels has a limited window within which to observe and classify the behavior of channel flow. The pressure component of Bernoulli's energy equation is useful for pressurized pipe flow but gets disregarded for the surface of open channel flow since atmospheric pressure or gage pressure is considered as zero pressure. Another component of the energy in open channel that was disregarded by the traditional theory is the spiral flow aspect of the overall flow. This is acceptable to neglect for continuous, long and straight channels but compromises the predictive ability of the uni-dimensional theory within transitions or discontinuity regions of a flow. 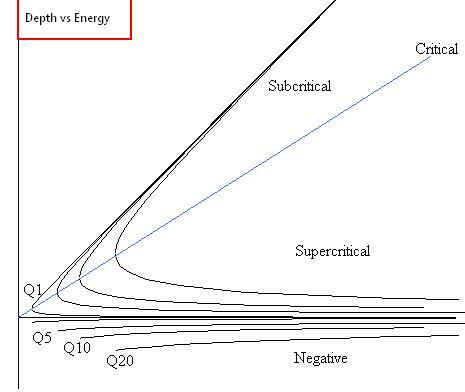 On first glance, one needs to ask about the practicality of including a plot of the negative depths in the graph. After all, and according the variety of the hydraulic texts, the negative depth is supposed to be an imaginary depth that has no bearance on reality. and the hypothetical flow for the ﻿﻿negative depth﻿﻿ which is extremely unstable to the extent it is assumed that it can﻿not manifest in the physical realm. Copyright 2012 Ali S. Fayad, Discoverer of The Explicit Alternate Flow Depth for Rectangular Open Channels. All rights reserved.